One of our most popular sellers since the drive to puch eco-friendly products, we have a full range of Cotton Shopping Carrier Bags in stock and ready for next day delivery at a great price! We also have a unique range of great colours that are bright and vibrant, so what are you waiting for? Need to know more? Read our Buyers Guide for more information about Cotton Bags! 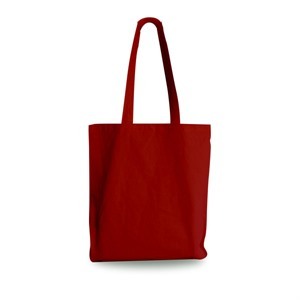 These bags are made from natural unbleached canvas and 100% dyed in Red. Made from strong 135gsm cotton. Strong cotton handles are sewn onto the bags and can hold heavy weights. Want a specific colour or size? Please order a sample if this is critical. Made from 100% bio-degradable cotton. Most commonly used in retail stores, boutiques and supermarkets. These bags are long lasting and can be used again and again! Our stock of Cotton Carrier Bags are made from natural unbleached canvas and can hold heavy weights, we are able to overprint them with your chosen design. A simple 1 colour print from as little as 100 bags. Simply fill in our <a shape="rect" href="/print/quick-quote.aspx" tabindex="0">Quote Request From or Call Us on 020-3002-9960 and we will get you a free No Obligation Quotation.